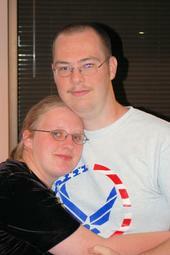 This tutorial was written by Amanda Carter on August 5th,2011. Please don't copy or claim as your own. A linkback is apprecited if you use my tutorials, I would love followers and seeing your results so please feel free to contact me at carter_mandy@bellsouth.net. This tutorial requires some knowledge of your program. 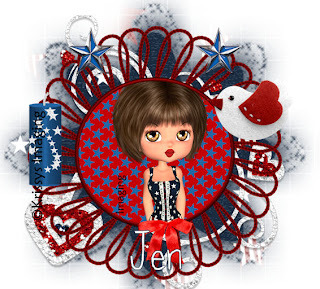 PTU Scrapkit title The Courtsey of the Red,White and Blue by Sleek N Sassy, you can buy her beautiful scrapkit at Scrappin Dollars. Tube of choice I am using a poser from the kit titled sweetheart 2-5. Now let's get started, open a new image 650x650 transparent (your gonna need this layer later), and flood fill with white. Now open frame 3 from your scrapkit,copy and paste it as a new layer, resize if needed. Select your frame with your wand and expand by 3, then copy and paste paper 4 into it, and then invert delete. Then add your tube/poser. Now add your doodle to the top of raster1. Now go to your raster 1 and select all, go to paper 2 and copy and paste into selection and apply your mask, then merge group. Close out your mask and resize by 75 percent your tag by merging together all layers and then going to resize and resize to the size above. Now add your font.. My font isn't funky enough size 25. Crop to your liking,add copyright information and then your done. Thanks for doing my tutorial!!! !